A sofa is a great place to relax and watch the game. The Kitchen table is great for eating meals. Your bed is simply wonderful...for sleeping. Unfortunately, a sofa, a kitchen table and a bed are not great places to comfortably work and be productive. Yet our own observations show this is exactly where people are trying to work. Laptops balanced on their knees, backs bending just to get the right angle to see the screen - it is a painful just to watch. This problem, especially for young people, stems from lack of space to have a full size desk and office chair. If you are in a dorm or a tight apartment, you just don't have the space to have a full size desk. The Edge Desk System claims to be the answer to this problem. An ergonomic desk and chair that folds and unfolds in under 30 seconds. At 25 pounds and just under 7 inches deep when folded flat, The Edge Desk can be stored under a bed and setup in seconds when you need to be productive. We were very skeptical of the claim "setup The Edge Desk in under 30 seconds" - but as the video shows, it is true. The Edge Desk is incredibly easy to both setup and then fold away for storage. At 25 pounds, you would not want to lug it all over town, but definitely can move it from room to room or throw it in your trunk. It is easy to get caught up in how portable and easy to setup the Edge Desk is...but that misses the more important point. The Edge Desk System is an ergonomic powerhouse! The ability to adjust the height, angle and tilt of the desk, to suit individual body size and desk preferences, is functionally fantastic. We have folks of all different sizes in our family and The Edge Desk was able to quickly and comfortably accommodate all of us. The primary audience for The Edge Desk System is college kids and young folks in their first apartment. When space is at a premium, The Edge Desk System makes a lot of sense. I do also believe that families who live in cluttered homes will also see great utility in The Edge Desk System. As we showed in the video, we were able to make any spot in the house, a productive work space with The Edge Desk System. If you need a large permanent desk, look elsewhere, the Edge Desk is not for you. On the other hand, if you are looking for a portable, space saving, versatile and ergonomic work station, The Edge Desk System is a wonderful choice. 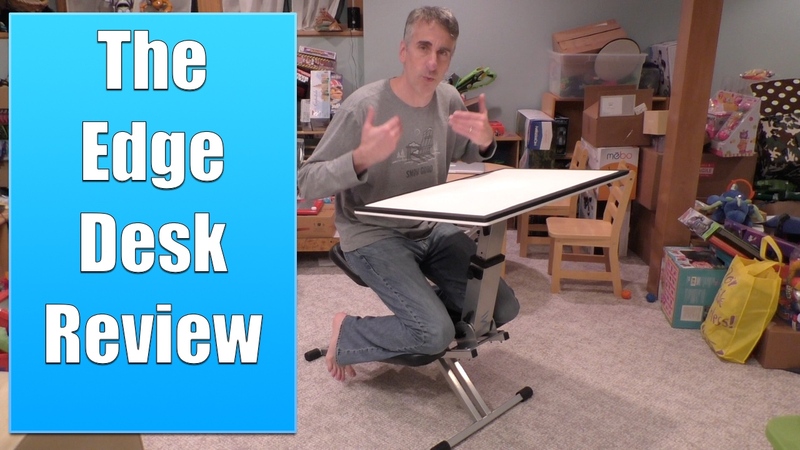 Disclosure: We received a sample of The Edge Desk System so we could provide an honest review. No other compensation was provided.